If you are wanting to retire to Tucson... do not say TUKSON, it is pronounced Too-sahn. Tucson with a population of around 600,000, with over 1 million in the metropolitan Tucson area, is Arizona's second-largest city, only Phoenix is larger. Tucson is an hour and a half to two hours from Phoenix a distance of 100 miles on Interstate 10. Tucson is 64 miles, an hour's drive on Interstate 19, to Mexico. Tucson is surrounded by mountain ranges, and has an elevation of 2400 feet... Tucson's climate is very similar to Phoenix, very pleasant in the winter, it's a little warm in the summertime. Because of its size Tucson offers the best of big city living without being too big. It is a university town, the University of Arizona is the largest employer in the Tucson area with over 10,000 employees. it has all the shopping, healthcare options, and housing options that you would expect in America's 32nd largest city. It has a Western feel with Tombstone an hour away, it also is very close to two of the three major wine producing areas in Arizona. Among other attractions in the Tucson area is Saguaro national Park, and Davis-Monthan Air Force Base with a large collection of mothballed planes. Tucson will be attractive to the retiree that expects all of the basics to be covered locally... But does not mind the short, two hours max, drive to Phoenix for things such as major professional sports teams. Tucson has an international airport and is only an hour and 20 min. away from the Phoenix International Airport. Tucson is popular with military retirees, due to the Veterans Administration hospital located in Tucson. When you retire to Tucson you will be attracted to the bargains in the housing market, here and in other places in Arizona, your housing dollar goes a long way currently in Arizona. Saguaro National Park located to the east and west of Tucson is home of the Saguaro cactus, the largest cactus found in the United States. These hearty giants live for 200, sometimes 300, years and are only found in the Sonoran Desert. Saguaro National Park is located outside of Tucson, Arizona and protects forests of these unique and huge cactus plants. Located to the west and the east of Tucson, Arizona, 91,453-acre Saguaro National Park is one of the best places to see these giants. When you are driving from the desert floor to the mountains you will notice the Saguaro's disappear at about 4000 feet elevation. Each year in February PGA Tour stops in Tucson for the Accenture match play championship, played at the Dove Mountain Ritz Carlton resort. The tournament is the only PGA Tour match play event played in the US...it attracts an international field of the top 64 players in the world. The players enjoy the resort atmosphere and competing on a well manicured Jack Nicklaus designed golf course. 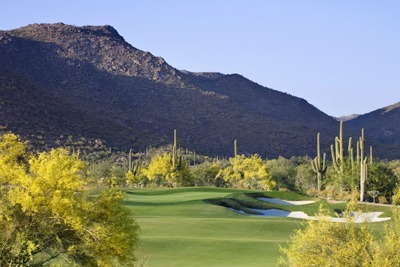 The fortunate members of the course that retire to Tucson enjoy it year-round. Retire to Tucson and enjoy all the amenities of Arizona second largest city... you will have many real estate choices, among them several active adult golf course communities. Now is a great time to enjoy below average prices for homes.